When omnipresent Earth microbes stow away on space missions, they can contaminate tests meant to discover traces of extraterrestrial life. For the first time, NASA scientists used gene sequencing to examine which types of bacteria live in the “clean rooms” where technicians assemble spacecraft components. They found that the cleanest rooms actually harbored the largest lineup of extreme bacteria. The most stringent NASA clean rooms sterilize and filter for no more than 10 particles per cubic foot of air, counting particles roughly equal to or greater in size than the smaller types of bacteria. But when ultraclean conditions kill off typically dominant common bacteria, they may leave room for slow-growing but hardy bacteria which can survive on little nutrition and water, according to the study conducted by researchers at the Jet Propulsion Laboratory in Berkeley Pasadena, California. Mancinelli agrees that most of the bacteria found in the study shared the ability to survive dry conditions, despite being spread out across three environmentally different NASA sites in California, Florida, and Texas. Such tough microbes present the greatest risk for contaminating space missions because they might be able to survive a trip to Mars or beyond. Since the first Viking spacecraft headed for Mars in the 1970s, NASA has focused its screening efforts on spore-forming bacteria. Spores represent some of the hardiest organisms found in soil and air, and they grow easily in culture-based assay tests that NASA uses. The study’s more comprehensive gene sequencing tests, however, found only traces of spores in the clean rooms. The bad news is that when NASA contamination tests focus on detecting and eliminating spores, they miss a host of other microbes, said Mancinelli. But he also pointed out that gene sequencing merely detects the types of bacteria, not how many of each type were present. This inventory may come in handy on missions sampling Martian soil for signs of extraterrestrial life, because scientists can screen out false positives if they know which organic material comes from Earth bacteria. Another issue for NASA is protecting other planets from Earth microbes – and protecting Earth from extraterrestrial contamination. 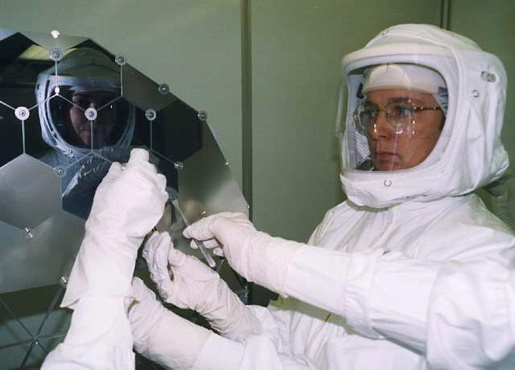 Many spacecraft components undergo additional heat treatments and other precautionary procedures after assembly in the clean rooms, which helps keep spacecraft clean if not completely sterilized. “The current requirement for Mars missions don’t require sterility, [partly] because most places on the surface of Mars are too cold and dry for organisms to live there,” explained Conley. NASA missions have found no strong evidence of life currently existing on the Martian surface, which has lain exposed to radiation for billions of years. If Martian life exists, it’s likely located deep below the surface, beyond the reach of currently operating missions. Surviving the long voyages through space would also be difficult for most Earth microbes, given the high amounts of space radiation, which tends to destroy DNA. Planetary protection will undoubtedly become a greater concern if manned missions reach Mars and beyond. That’s when NASA may turn to sophisticated gene sequencing tests more regularly, according to Conley. “Once we put humans on Mars, it’s unavoidable that they will be exposed to Mars material,” said Conley. And where humans go, bacteria will follow. Flowing water on Mars gives scientists reason to hope that the Red Planet harbors life. Extreme microbes seem to live anywhere we look-even at the bottom of the ocean, where they may hold the key to future medications. Want to stow away on your own mission to space? You’d be joining an elite group of people. Just one thing: the Jet Propulsion Laboratory is in Pasadena, not Berkeley. Thanks for the catch Sam. That mistake was my fault as the editor for this story. I’ve made the correction in the text.